The task for students was to build with a specific set of skills. It needed to be able to stay inside a marked circle and have away to push other robots outside the circle. 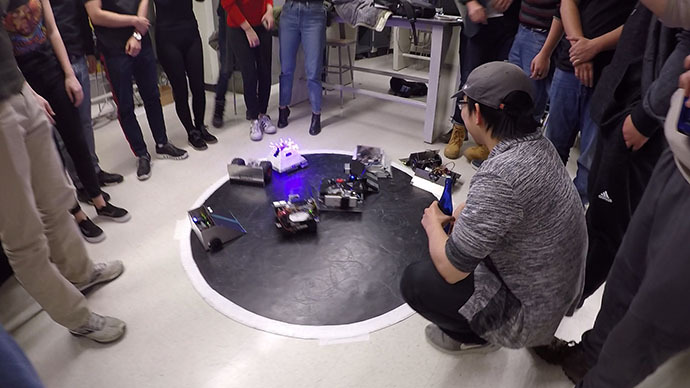 “Just like sumo wrestling but a version with robots,” says Kenneth A. and Mary Ann Shaw Endowed Professor of Practice in Entrepreneurial Leadership Yevgeniy Yesilevskiy. Students in Yesilevskiy’s Introduction to Robotics class had a lot of freedom to develop their own designs. “Basically we were building robots that can sense their environment and we do that using sensors. For us personally we used IR sensors to detect lines and a distance sensor that will say high or low whether or not it sees something in front of it or not and that is how we sense the enemy,” says Elton Zhang ’19. “All the teams had to pick out their own motors, code up their own sensors. They had to house everything so lot of wiring, lot of controls, lot of hardware machining,” says Yesilevskiy. Once the robots were built, it was time to test them in the ring. “We had a double elimination tournament, two losses knocks you out,” says Yesilevskiy.